loss. 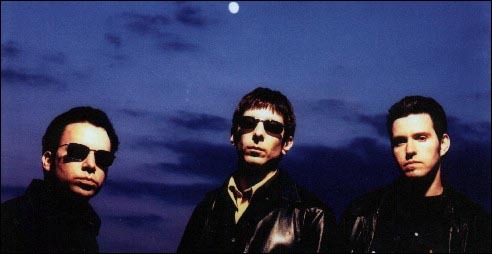 Mercury Rev made secret psychedelic vistas palpable for the listener. (vocals/guitars), Grasshopper (vocals/guitars), and Jeff Mercel (piano/drums). killer bass line in "Black Forrest (Lorelei)" floats around the chords. way in many of the songs. "Moving On" is one of the best vocals they have done. AL: When did you record the latest album, The Secret Migration? AL: Did you plan to avoid Tarbox Studios this time? can go to Tarbox later on and shape it up and mix the record." AL: How do the songs on the album usually start out? or vice versa. A lot of the songs are written on piano or acoustic guitar. different ideas, and Dave Fridmann gets in the mix. AL: Did you set out to do a more stripped down acoustic album? Composers like Steve Reich and Philip Glass. repetition in music. Some of those arpeggios and tri-chord are mood altering. music. We are always trying new ways of doing that. think that affected its reception? weeks. The record comes out on that day and the record company shuts down. and touring there. There was a whole mental toughness going on in America. in America so fast. Many bands lose money on American tours. the west coast, the northeast, Texas, Florida, and Chicago, we do really well. America. This tour with Doves in May will be really good. AL: Will that be the biggest American tour you have done? that was pretty big. We also played with Wilco a lot when we did All Is Dream. That was good. This Doves/Mercury Rev will be pretty big. AL: What will the new set be like? going to concentrate on the new album. AL: You did a solo record a few years ago. What happened to that record? with Mercury Rev, like the Russo brothers. They are now in the band Hopewell. Suzanne Thorpe and David Baker? Spain and Italy a few years ago. AL: Who plays with you now? Grasshopper: There is the three of us. Then there is Carlos Anthony Molina. piano. Our new drummer is named Jason Miranda. So there are five of us. AL: The song "Moving On" seems like new territory for Mercury Rev. mostly Jeff and myself singing on that song. AL: Do you think that there were new influences on this record? that we were all listening to it was that stuff. AL: There was a connection to Tony Conrad at some point? 1988. We played together a few times. AL: Have you played any shows in the Catskills before? Sparklehorse. We have played at some colleges around here like SUNY Purchase. Those shows usually go pretty good. College kids are usually more into new music. crazy. Did you ever hear him do that? Sparklehorse opened for us on a tour. I think that he continues to do that. AL: How many songs did you record for The Secret Migration? AL: How has the reaction been to the new material? Republic, and Hungary. My grandfather is Polish, so I would like to go to Poland. There are more concerts going on in those places. being ex-junkies. Was that rumor just made up by the press? about. It's all about picking up the pieces and going through that experience. have nothing to add." What do you think about that? the music because it comes from a special place. The music is very personal. it's hard for him to talk about it. reclusive is how he is in your personal experiences with him? you like to work faster and do an album a year and tour less? written a bunch of other books. AL: Are there any new records that you like? name is Hanne Hukkelberg. She is like a jazz singer. I saw her not too long ago. Soundtrack of Our Lives and Nikolai Dunger. We worked with him. Grasshopper: We met the girl from The Concretes. so I think it is finally coming out. reading. Do you still do that? Grasshopper: Yeah. I just wrote a thing about Hunter S. Thompson. and had some good choices up there. Bob Dylan. That is great. I enjoyed that. Fante, Bob Dylan, and James Joyce too. AL: We have been going on a while here. AL: Is the DJ thing something you have been doing for a while? Grasshopper: Yeah. Mostly in Europe. In Brooklyn. AL: Have you lived in New York City before. Grasshopper: I did for four years. None of the other guys did. appearing at "Coachella Valley Music And Arts Festival"